From privacy coins I really like Zen Cash project, with their secure nodes, domain fronting, private messaging and DAO/treasury system on roadmap. Team and community is also great, similar as here. I truly believe in both Sky and Zen. More comparisons, please!!!! It's so much easier to read a table than researching each website and trying to learn from social network. 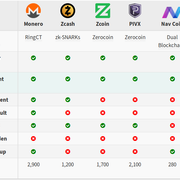 Is Skycoin already better than Monero across the board or is that going to happen later this year? Is the public blockchain obfuscated as well? For example will it show a transaction between two unrelated random addresses? Maybe someone is willing to make the same one for this chart?